It was so much fun reading everyone's comments about Irish Chain Quilts. I think Melissa's book, "Irish Chain Quilts" would be a great book to add to anyone's quilting book collection. 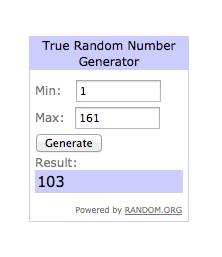 ...so out of 161 comments, #103 is the lucky winner! I just finished an IC quilt top today! Thanks for the chance to win!